Designed for young volleyball players this ball makes sure the sport stays fun. With less ouch from bumping and passing, novice players can learn to love the game for a lifetime. 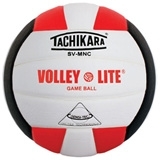 The Tachikara Volley-lite Color Volleyball is regulation size but is lighter and made with brightly colored composite leather so it is softer and more visible on the court. Ideal for the youngest setters and spikers, this is an ideal starter ball.